Idli is the most often made breakfast in my home and its Hubby’s favorite as well but unfortunately they do not sit well with the kids. And as for me, more than idlis, I prefer idli upma a lot. 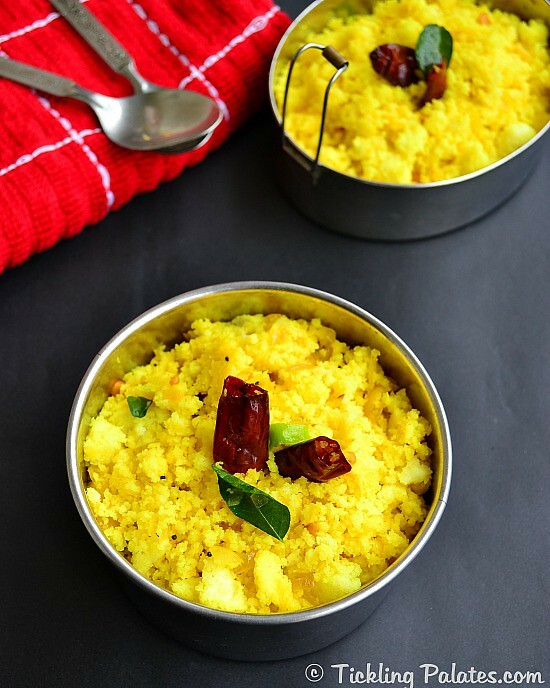 Whether you have left over idlis or fresh idlis, converting the idlis into this upma will be even more delicious. 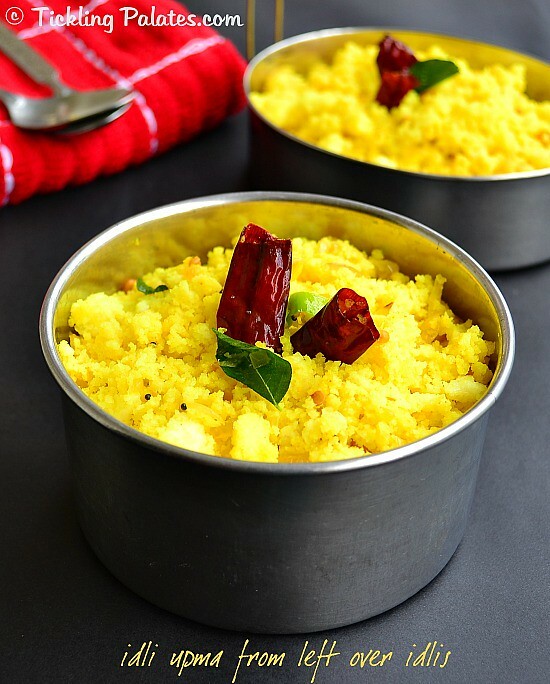 I recently made a lemon version of the good old idli upma and packed it for the kids lunch box to school and my kids who whine at the sight of idlis, loved it utterly to my surprise. When made properly, they turn out so soft and fluffy that you will not even know that they are made of idlis. Heat 1 to 1-1/2 cups of water in a sauce pan. Pour it into a shallow bowl and drop 2 to 3 idlis at a time and let it be for a few seconds. Drain them with a spatula and place them on a plate. Repeat for all the idlis. (If using fresh idlis skip this step). This will soften the old idlis and make them moist and will also become easy to crumble without the idlis sticking to your finger. With your finger tips, crumble all the idlis and keep aside. Chop onions and green chilies finely and keep aside. Heat a pan with oil. Add mustard seeds and when they crackle, add broken whole red chilies, urad dal and channa dal and roast for 1 minute till they become golden brown. Add onions, green chilies, turmeric powder, 2 pinch salt, curry leaves and sauté till the onions turn translucent. Add the crumbled idlis, lemon juice and mix till all the ingredients get mixed well together. This should take just 1-2 minutes. Check salt and add more if required. 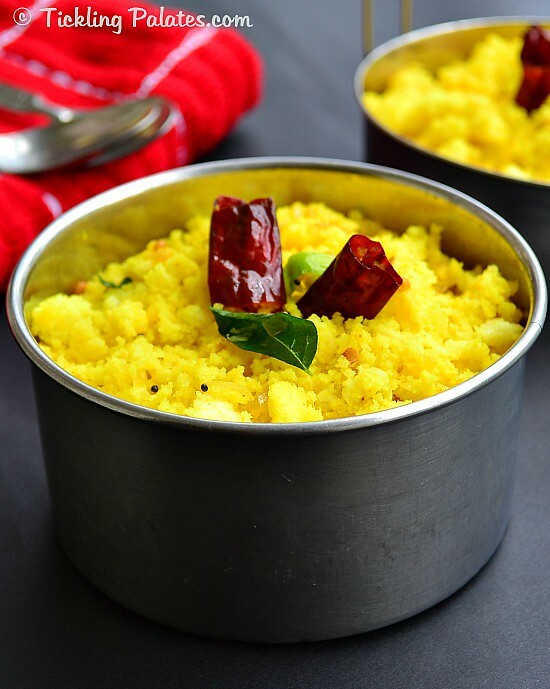 Cook over medium low flame to prevent the upma from sticking to the pan. Take off fire, garnish with coriander leaves, if preferred and serve hot. While using old idlis, instead of crumbling them, you can also cut them into pieces. If you are going to pack for lunch box, it may dry out a bit, so I recommend crumbling them. As the idlis already have salt in them, take care while adding salt. You can also add roasted peanuts while doing the seasoning and they will give a good crunch to the upma. Excellent recipe, tried it, turned out very well………….keep up the great work…..cheers! !